Our Harvest multipurpose sun shade cloth is made of 100% UV stabilized high density polyethylene. The garden shade cloth is perfectly works to reduce the sun's heat and rays to protect your plants. Its light weight and durability make it a superior choice for all types of shade applications.Protect plants or greenhouses or pets from harsh sunlight and overheating, protect swimming pool from leaf, create a comfortable shaded area anywhere needed, such as garden,patio, porch, balcony, kennel, swimming pool and playground, serve as privacy and windbreak screen. 100% UV stabilized High-density polyethylene. EASY TO USE. 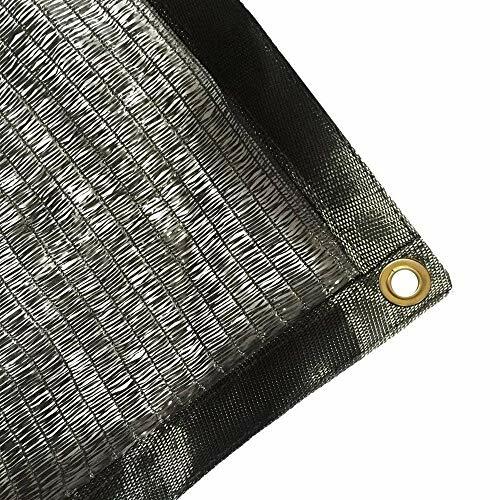 Grommets are located along the entire reinforced edge for easy hanging.All 4 sides taped by double stitched with one metal grommet per 2 feet Interval. MULTIPURPOSE APPLICATION.Mulitipurpose Application. Protect plants or greenhouses or pets from harsh sunlight and overheating, protect swimming pool from leaf, create a comfortable shaded area anywhere needed, such as garden,patio, porch, balcony, kennel, swimming pool and playground, serve as privacy and windbreak screen. If you have any questions about this product by Harvest, contact us by completing and submitting the form below. If you are looking for a specif part number, please include it with your message.